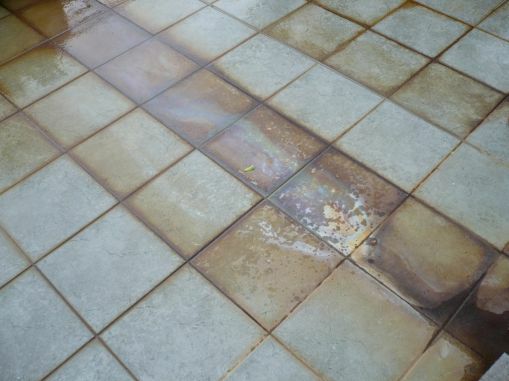 Rust marks on tiles can either come from within the surface (if it's a natural stone), or from external sources. External sources include outdoor furniture, nails or metal filings, pots, or any other metal objects left on the stone or tile in the presence of water. Mineral ferrous veining can be part of the stone natural structure. While this can often be hidden for many years, heavy soaking can bring ferrous minerals to the surface with a yellowing discolouration. In some cases, spot marks can be very distinct with a bold colour contrast to the rest of the tile. 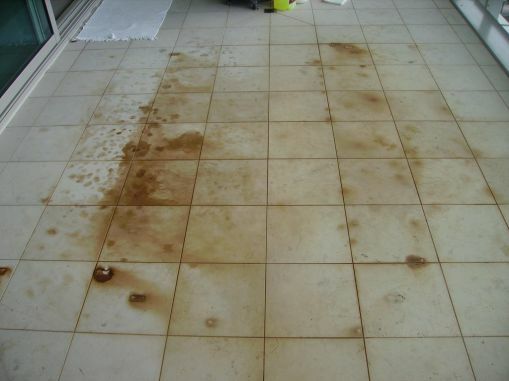 Can rust marks be removed from stone or tiles? Rust marking from an external source can generally be removed by a Deep Dirt Extraction treatment. Rusting or yellow discoloration from ferrous mineral veining requires a different approach, as the source of the discolouration is internal minerals occurring naturally within the stone itself. This requires a specialised Blemish Removal treatment – sometimes taking 2 or 3 days – to remove. Internal rusting is not always removable. If you have rust marks, you can book a free Slique Consultation – we’ll come and confirm your problem, and give you a quote for our Technicians to professionally restore the surface to as-new condition.